You’re satisfied with your smile appearance except for one thing — your teeth aren’t as white and bright as you wish they could be. So, you’ve decided to do something about their dull yellow color. You’re also thinking about buying a whitening product you can use yourself rather than a professional application. But you still want the answers to two questions: are home whitening kits safe? And, are they effective? By and large the answer to the first question is yes — if you use it as directed. The whitening agents in FDA-approved products are in safe proportions to other ingredients and won’t cause any major health issues. That said, if you go beyond the instructed dosage you could damage your teeth, especially your enamel, and cause long-term problems with your dental care. In addition, if you (or a family member) are still in your early teens, you may want to wait until you’re older. Although most permanent teeth have come in by puberty, their enamel still needs to mature. 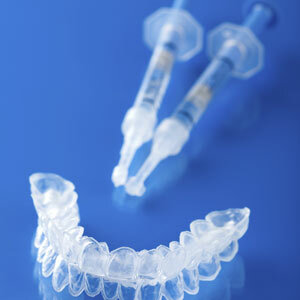 The chemicals in a whitening kit could be too strong for their under-developed enamel. It’s best to get our advice on whether your teeth are mature enough for whitening. As to their effectiveness, home whitening kits should perform as their labeling indicates. But there are some differences in effects between a home kit and a professional application. Although a home kit usually uses the same whitening agents (like carbamide peroxide), its strength is much lower than a professional treatment — about 10% of volume compared to around 30% in clinical solutions. This means it will take much longer to achieve the desired whitening effect that a professional application can in fewer sessions, and with less precision. In addition, home kits are only effective on surface staining of the enamel — discoloration within a tooth requires treatment by a dentist. You can get satisfactory results from a home whitening kit. But before you make a purchase, consult with us first — we can advise you on what to look for in your purchase, as well as determine if your teeth can benefit from whitening at home.